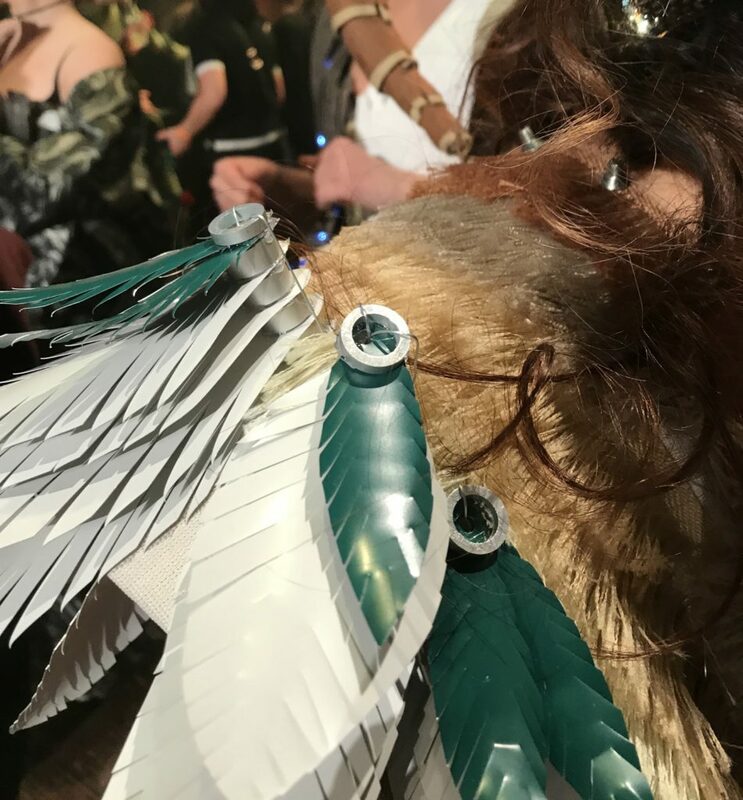 A team of designers from Unispace collaborated with Hunter Douglas Architectural to transform window shade components into a stunning, award-winning fashion garment that wowed crowds at the International Interior Design Association’s Stitch runway show, hosted by the IIDA Illinois chapter. The design challenge, which is now in its 14th year, partners manufacturers and design and architecture firms, giving them the unique opportunity to work side-by-side to conceptualize and create a fashion statement. 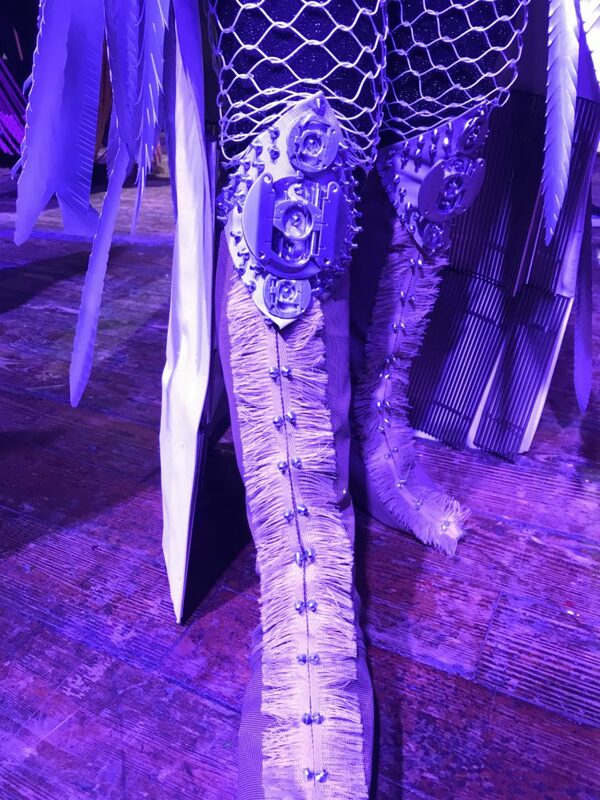 Pull cords, aluminum bars, beaded chains, brackets, levelers, and other window shade parts were morphed into a surreal outfit for the Stitch event, hosted in March at Chicago’s House of Blues. 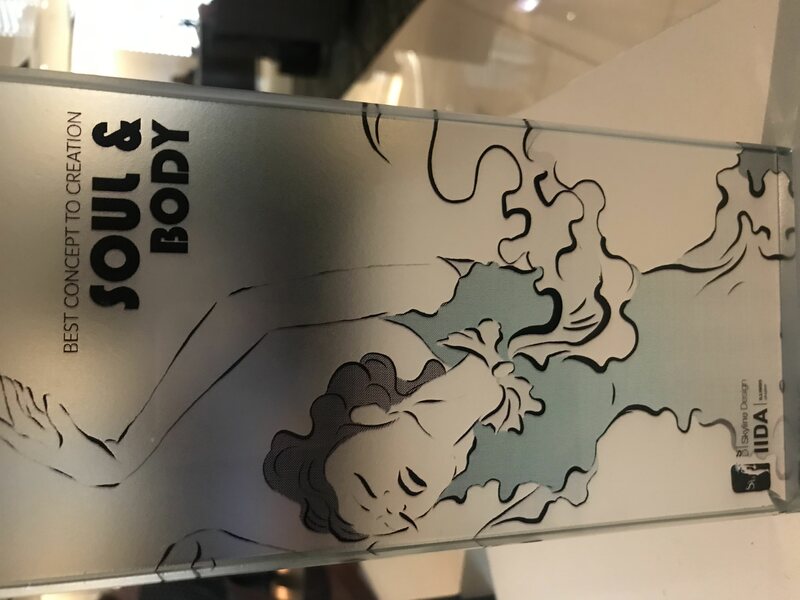 Unispace designers partnered with Hunter Douglas Architectural turn 14 different window shade components into an award-winning outfit at IIDA’s event. Unispace’s Kate Brown, Candace Mountain and Alex Dakas, led the design process, with coordination from Ruth Minnick, and guidance in material selection from Caron Christy, Hunter Douglas Architectural’s regional sales manager. 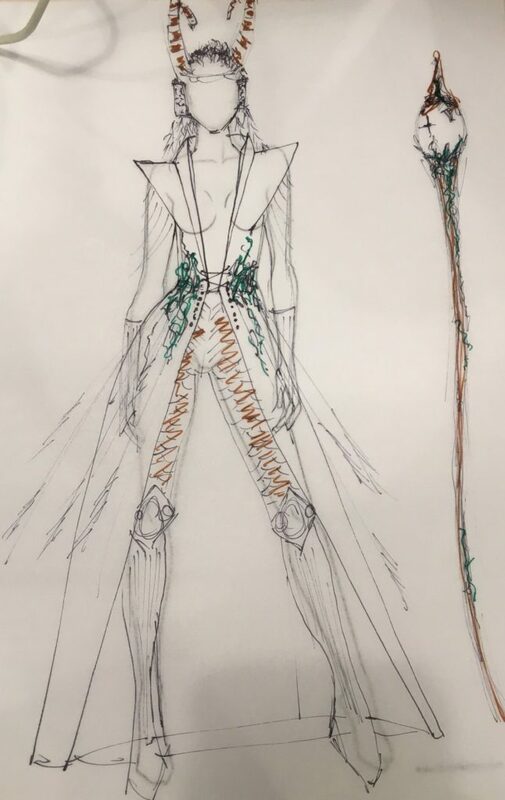 This year Stitch took on the theme, “Dichotomies: Opposites Attract.” The Unispace and Hunter Douglas Architectural team interpreted this by developing the nature-inspired concept, “Filtered Refraction/Intrinsic Reflection” for its dramatic runway look. Duality was reflected in the rich mixture of textured materials, embellished with traces of metallic studs, beads and coils, atop Mermet’s E Screen shade fabric. Alex Dakas models the design by Unispace featuring Hunter Douglas Architectural window shade components. 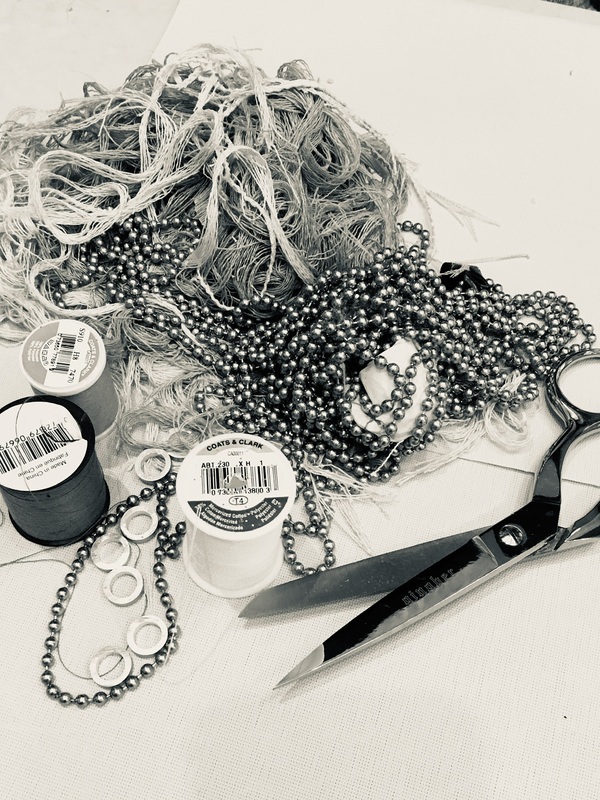 “As a manufacturer, events like Stitch offer an opportunity to get to know a client on a much more personal and organic level, versus always thinking about the next project or job or sale,” says Caron Christy. She says when Unispace first approached her about partnering, she knew it would be a creative way to collaborate, having been personally involved with Stitch in the past. But beyond that, Christy laughs, she had no idea what to expect an outfit made of over a dozen shades elements to look like. 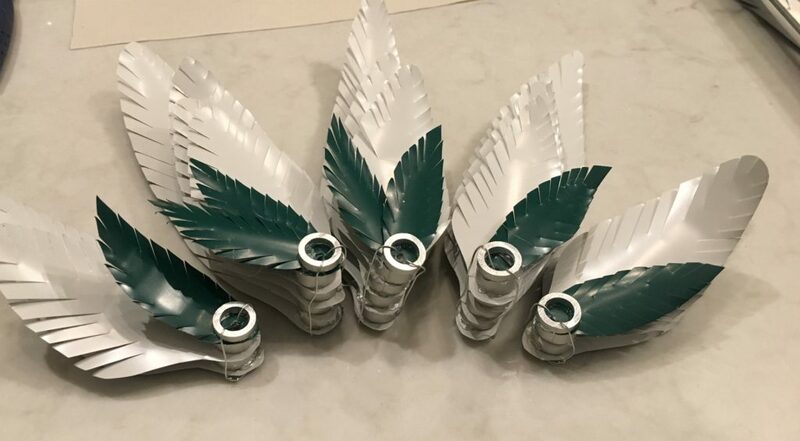 Hunter Douglas Architectural aluminum blinds were transformed into fashionable feathers. 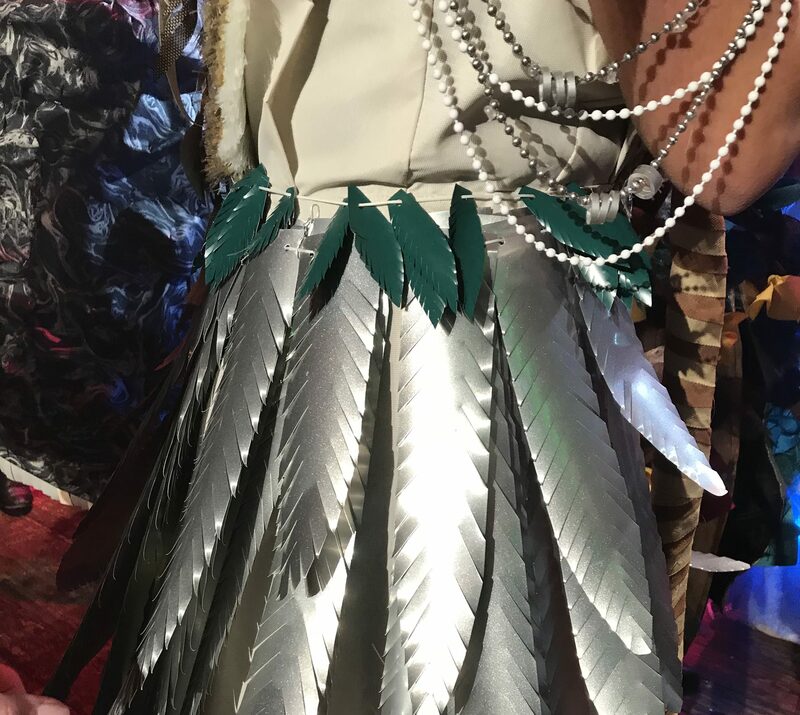 Aluminum blinds were cut into fashionable feathers for the IIDA Stitch event. 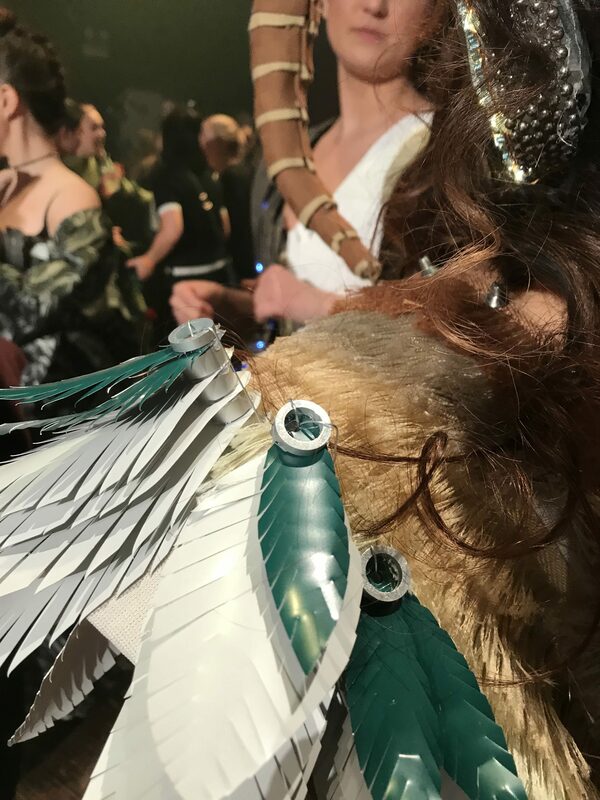 Behind the scenes, the design team worked off sketches and mood boards to reimagine shade pull cords as crocheted fishnet tights, blinds as feathered wings, and silver pull chain beads as arm candy. 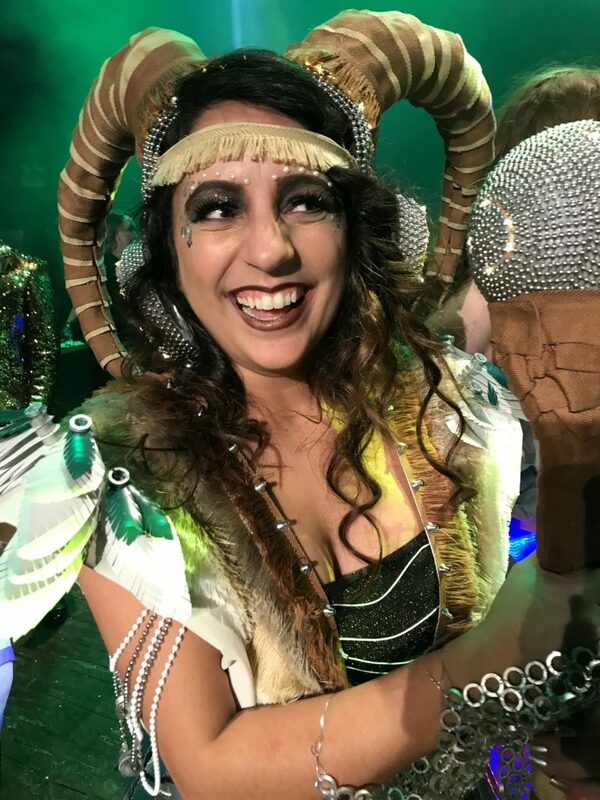 The outfit, modeled by Alex Dakas, was topped off with a horned headpiece which was ornamented with fringe trim, in hues like chestnut, camel and antique white, that was originally used as cotton ladder tape for horizontal wood blinds. 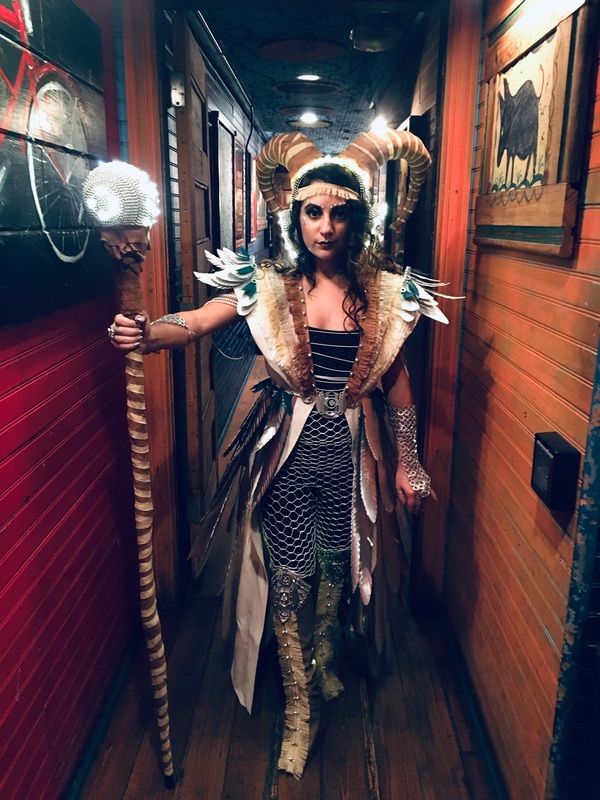 Along with 26 other models from design-manufacturer teams, Dakas strutted the runway at the House of Blues, which was packed with Chicago-based architects and designers. The event’s judges included TV host and producer Jackie Bender, Saks Fifth Avenue visual merchandiser Katie Porrey, and local socialite Wendy Sitti. The Unispace team led the design process with guidance on material selection from Caron Christy, regional sales manager at Hunter Douglas Architectural. The Unispace design team worked off sketches and mood boards to reimagine shade pull cords as crocheted fishnet tights. “We are so grateful to have been able to partner with Hunter Douglas. Working with Caron was wonderful, and we knew we had their support through the entire process. The most fun part for us was when we told people what our materials were, they had no idea how we would make an outfit out of shades and blinds, which motivated us even more. We found the materials to be incredibly inspiring, and our initial meeting with Caron sparked so many ideas,” says Dakas. Stitch offers designers the unique chance to interact with building products firsthand – like window shade levelers. Caron Christy, Hunter Douglas Architectural’s regional sales manager with Unispace’s designer Alex Dakas at Stitch. 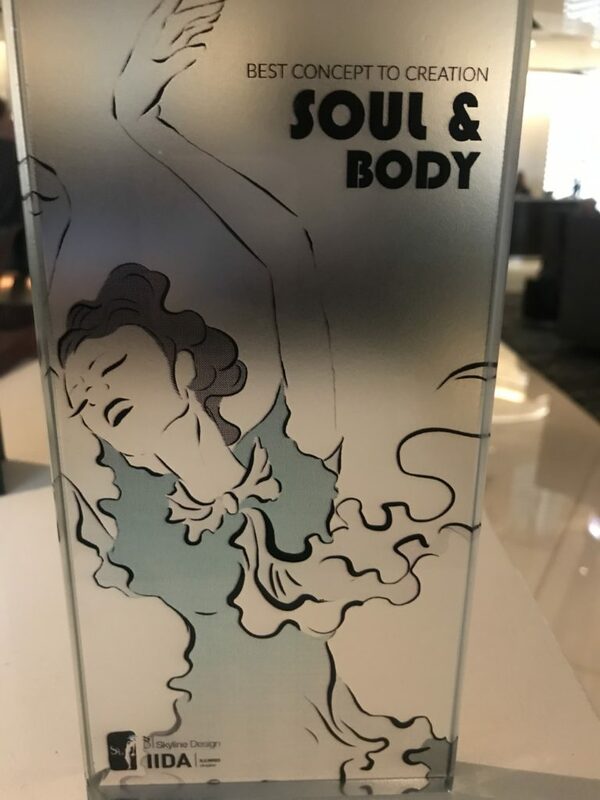 The design by Unispace and Hunter Douglas Architectural took home one of the top prizes for “Best Concept to Creation” at the Stitch fashion show. Another Hunter Douglas company, 3form, earned the Judge’s and People’s Choice awards after teaming up with HDR and Bentley for their concept, “Bound/Free.” The outfit surprised the audience with the unexpected revealing of beautiful, ombré layers of orange fabric concealed by a gray outer layer. The design reflected a butterfly emerging from its cocoon. Window shade parts, including idle end plugs, roller shade bars, Mermet shade fabric, clutches, brackets, couplers, and more, were transformed into an award-winning outfit at Stitch. Stitch offers designers the unique chance to interact with building products firsthand as they reconfigure the kit of parts – in this case, idle end plugs, roller shade bars, Mermet shade fabric, clutches, brackets, couplers, and more. 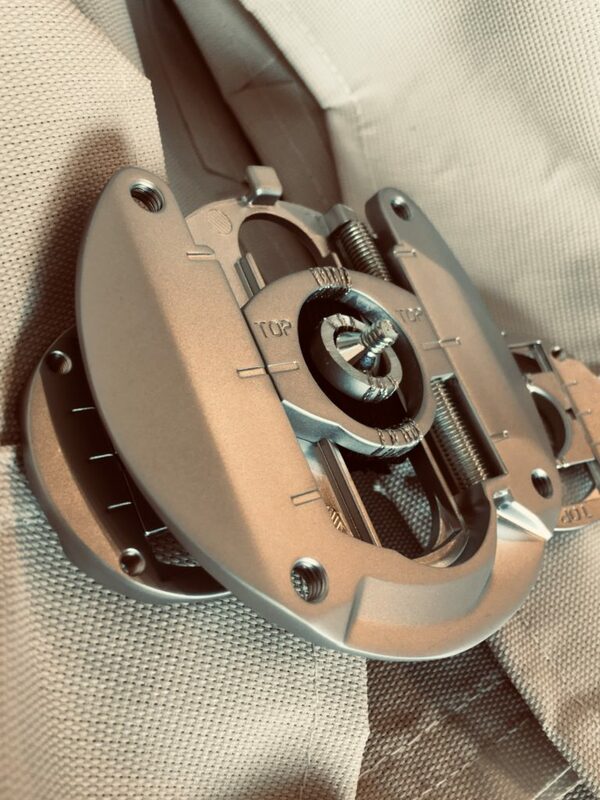 With freedom to explore and learn more about building products, the design teams turned functional parts and pieces into wearable art, while manufacturers benefitted from the chance to join the early phases of the design process. 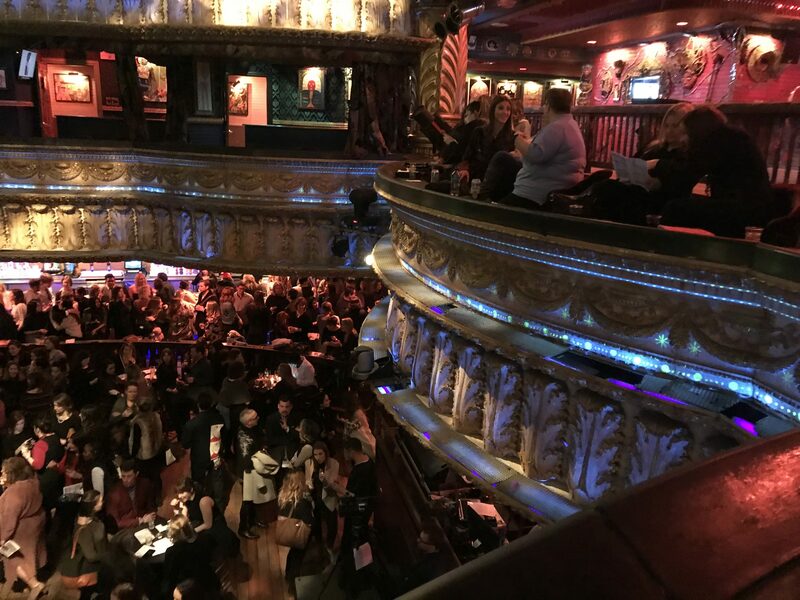 Over 500 architects, designers and manufacturers attended Stitch 2019 at the House of Blues in Chicago. 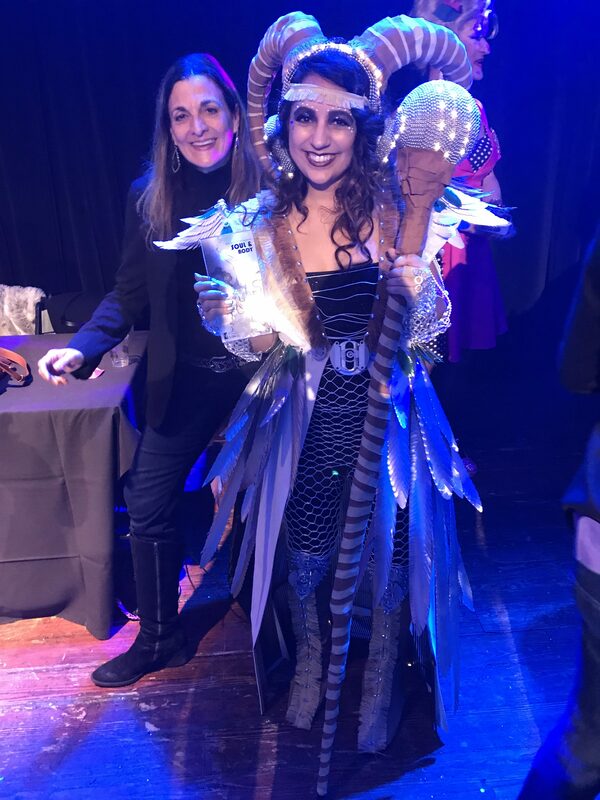 Events like IIDA’s widely attended Stitch 2019, also generate enthusiasm from the greater design community, as competing firms gather together to cheer on creativity. With an engaged audience, interactive online voting and social media livestreams, Stitch is an inspiring, after-hours playground that lets designers and manufacturers collaborate to rule the runway. Designers reimagined aluminum blinds as feathered wings and silver pull chain beads as arm candy.